A general catch up post to cover my general lack of inconsistency. Well the last couple of weeks have been very hectic but I’m going to try and write a little something down. On the weekend 7/8/9th me and Rach headed to the big smoke, after a quite annoying train ride we were pretty much exhausted and after a whistle stop tour around the rather awe inspiring St. Pancras station, we hit the hay quite early. On the Sunday we met up with a large and varied assortment of folks from different places. Much nattering was done and although the pub we had gathered in offered food, our plan was to hit WagaMamas for our nourishment needs. As typical as the weather is in the UK the once sunny skies filled with heavy clouds and our 10 minute journey was undertaken in vast downpours, but the food was rather tasty as promised, so it was worth it. We took a stroll and visit a Gosh Comics where I picked up a couple of nice titles and then we continued onto Forbidden Planet. The home of so many shiny things. It was really nice to put faces to the rabble that normally exist in electron form over the interweb. In the past few weeks there has been a light scattering of Left4Dead with Rachy and more recently Dok, I really do enjoy the game and can’t wait for the expansion to arrive. Our weekly adventuring team in City of Heroes is fast approaching level 40 and I’m looking forward to the Taskforces and content in the final 10 levels, which I haven’t seen before. I’m still playing some Dawn of War 2, mostly on campaign mode still, only seeking into multiplayer games occasionally, the game is certainly well thought through and my 2nd run on the campaign is still quite fresh. I think the customisable characters allow for some very different play-styles between games. I’ve also been playing a couple of Java games as my flu/cold/lergy meant I didn’t feel like playing anything that needed to much concentration. Well I’ve finally seen Watchmen on Monday just gone. I really enjoyed the film adaptation and thought most of it was as true to the original as could be expected, superseding my exceptions at times. After a post-viewing discussion with Dok I think I nailed down one of the elements that I felt wasn’t as obvious. In the film as in the book the threat of nuclear war is made quite clear, but I feel the book illustrates the populations anxiety and the heightened sense of impending doom. 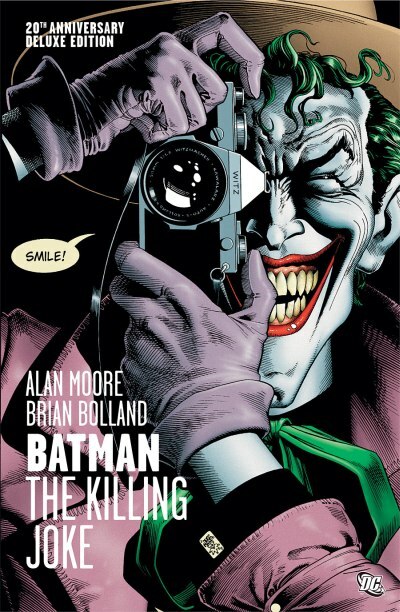 I’ve not read lot in the last few weeks, Rachy got me Batman : The Killing Joke which I found a wonderfully dark and gripping storyline. Thanks to Rockjaw for suggesting it on the Limited Edition podcast a few episodes back.